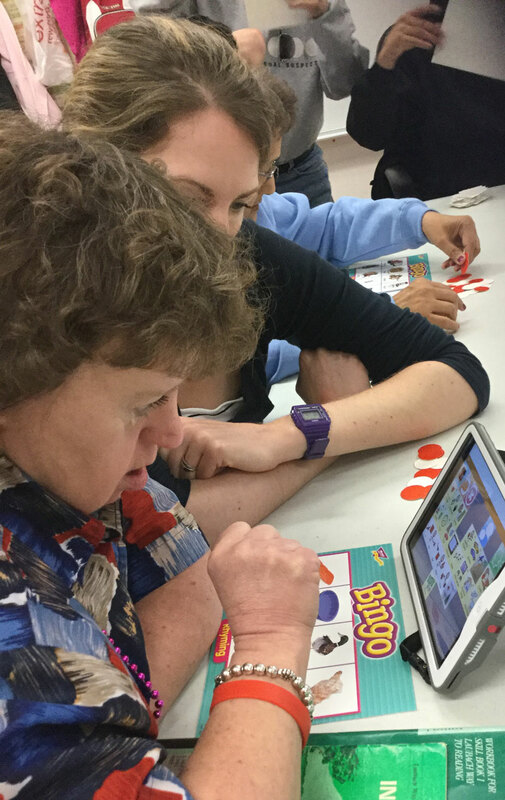 The mission of the Communication Technology Education Center (CTEC) is to connect people of all abilities through AAC, so that they can give voice to their own journey. CTEC will serve individuals in the counties of Sacramento, Yolo, Alpine, Colusa, El Dorado, Nevada, Placer, Sierra, Sutter and Yuba. Two ladies pictured with an AAC device. Establishment of higher standards and expectations for individuals with disabilities in our region for whom "not being able to talk does not mean you have nothing to say." Technology creates opportunities for participation with and contribution to society. With communication comes power and connectivity. With education comes freedom and choice. Individuals take ownership of their own journey. The person who will be using AAC leads the process; the team learns to follow this lead. CTEC integrates empirical and clinical expertise with current research in best practice. The core CTEC team includes Speech-Language Pathologist, Mentor AAC User, Family & Training Coordinator, and Assistive Technology Specialist. The AAC user's team joins the CTEC team to learn how to provide support. CTEC uses a broad exploration of AAC options, as opposed to a step-by-step hierarchy. There are no prerequisites to being able to benefit from AAC technology.